The President's private jet was clipped at LaGuardia Airport amidst Trump discussing improvements to the airport with Governor Cuomo. The mishap occurred at the aging airport when the President's personal 757, which he used during his 2016 campaign, was involved in a fender bender of sorts while someone else was parking their aircraft. The offending aircraft was maneuvering into a position to park when it clipped the wing of Trump's parked jet Wednesday morning around 8:30 a.m. The accident was confirmed by The Trump Organization, and the President nor any staff was onboard at the time. Ever wondered what it is like inside President Trump' Boeing 757? Here is a close up look inside the giant aircraft on a short guided tour. The accident was confirmed by the Port Authority of New York and New Jersey which is responsible for overseeing operations at LaGuardia Airport. They also said no injuries were sustained and the accident had no impact on regular airport operations. Ever since the campaign ended in 2016, the presidential candidate's 757 has become somewhat of a landmark at LaGuardia where people often stop to take photos while taxing down the runway. 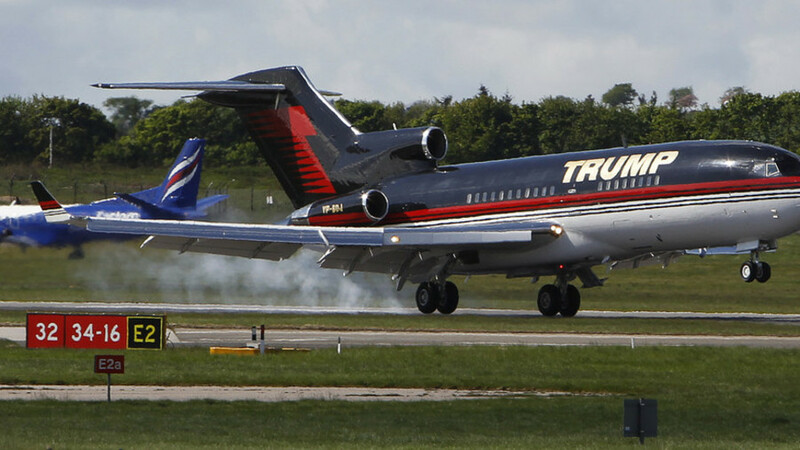 Stop using old, out-dated photos of Trump’s jet. The old 737 is long gone.